If you’re taking a cruise from Seattle, the best option is to have someone drop you off at the port. It’s faster, cheaper, and more convenient than having to park. We know, however, that’s not an option for everyone and thousands of people drive to the port every week. The lack of competition combined with expensive real estate mean that parking prices are some of the highest in the country. Still you do have some options to choose from, including traditional lots located near the port, Seattle hotels with free parking, and airport parking. The map below shows the traditional parking lots near cruise terminal. Below, we have more details on each option. This is the main parking service for the port and the one linked to by the port’s official website. Republic Parking Northwest offers two different parking areas. It has a large lot across Magnolia Bridge from Pier 91 and a parking garage across Alaskan Way from Pier 66. Parking costs $26 per day for regular cars/trucks at Pier 91. We’re not sure why there is a such a price difference, but it is considerable. There is no extra charge for oversized vehicles. RV parking cost $40 per day. Both lots offer 24/7 patrolling security and free shuttle service for you and your bags to the port. Prepay online to earn a $1 per day discount on your parking. This lot is located just slightly north of Pier 91, within the confines of a National Guard armory base. Despite its location near this cruise terminal, it serves as parking for both Pier 91 and Pier 66. It’s located about two miles from Pier 66. Parking costs $21 per day ($147 for a 7-day cruise). 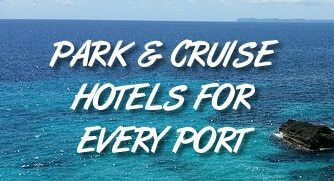 This makes it convenient in having one price no matter which cruise port you will sail from. There is also free shuttle that will drop you and your luggage off at the port of your choice. Space can be limited, so it’s suggested you make reservations online ahead of time. If you’re like us, you might be surprised at the extra expense of parking your car while you cruise, especially when airport parking is considerably cheaper. We’ve found several airport lots that charge as little as $6-8 per day. It’s tempting to consider these lots as a way to save some cash, but keep in mind the distance between the airport and the cruise port. Any money saved on parking will likely be eaten up by the cost of commuting to your ship (taxis charge a $40 flat rate between the airport and downtown Seattle). If you are staying in the area, contact your hotel to see if they will allow you to park your car for the length of your cruise. Sometimes you can stay only a single night and be allowed to park for free for the length of your trip. Here are more details on Seattle hotels with cruise parking.